Of all the supporting players on Matthew Sweet’s 1990 album Girlfriend, it’s his lead guitarists who drew all the attention. Small wonder, when the guitarists in question were Richard Lloyd and Robert Quine. That’s some serious fretboard power. On a record that’s somewhat sonically unsatisfying (small-sounding, excessively dry, underwhelming low end), Lloyd and Quine provide most of the excitement and most of the rock. 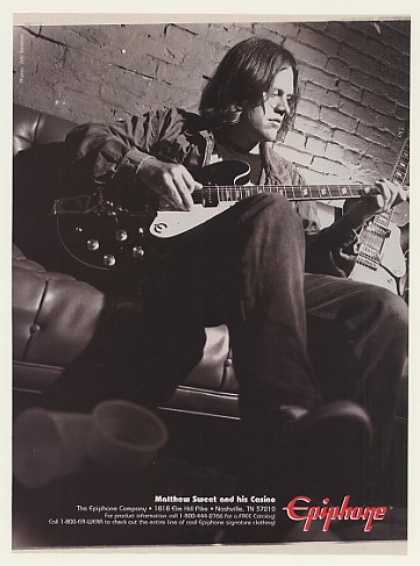 By the time Sweet made 100% Fun in 1995, the grunge wave had crested and receded, but his sound was still saturated with alt.rock sonic signifiers (similar things happened to the Posies and Aimee Mann in the same period). Compared to Girlfriend, 100% Fun sounds like it’s been pumped up with steroids. Sweet’s Epiphone semi-acoustic grunts and growls rather than chimes, and Ric Menck’s drums are an enormous foreground presence rather than a discreet tapping from somewhere at the back (or worse, the side) of the mix. Good rock music is all about the energy and power provided by the drums, and it’s Menck who steals the show on album opener Sick of Myself, despite the best efforts of Television’s Lloyd and his squalling Fender. Menck smashes his crash cymbals in the intro and choruses, plays big smacking hi-hat quarter notes in the verses and generally pounds on his snare drum like it’s done him a personal injury. There’s no showiness to any of it. He’s just making as big a noise as possible. He sounds like he’s having a ball doing it. 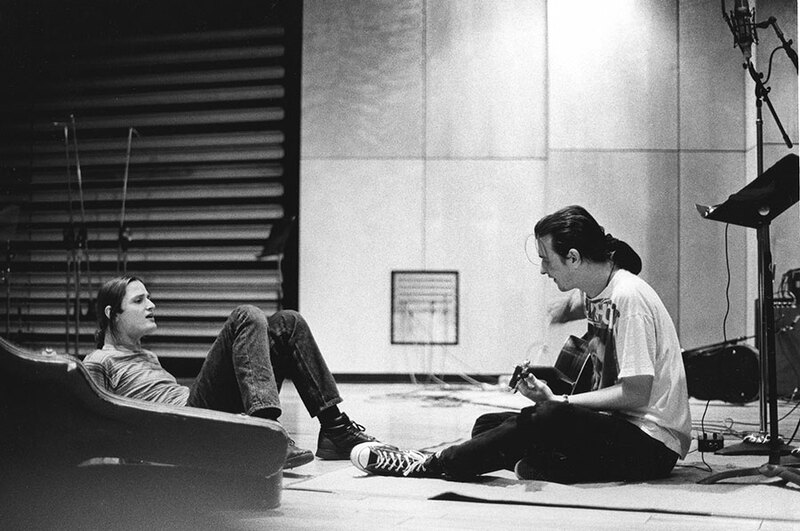 According to Sweet, when they tracked what became Sick of Myself, he hadn’t really written the vocal parts other than the hook line in the chorus, and it was how great the drums and rhythm guitar track sounded together that inspired him to finish the piece and make it into a proper song. Aiding and abetting him were producer Brendan O’Brien and O’Brien’s frequent partner in crime, tracking engineer Nick DiDia, who cooked up a particularly great drum sound for the album. The snare is absolutely huge (it sounds very wide, if that makes sense – presumably from just the right blend of close snare mike and stereo rooms, but I’m taking a shot on that. Could be wrong), and if the toms are comparatively small, they don’t really play a huge part in the performance; if O’Brien privileged the snare when mixing, he made absolutely the right call. It’s the crucial instrument in the mix. It’s what supplied the song with its attitude. Fittingly, the guy playing it sounded like he was having 100% fun. Sweet shills for Epiphone (1996) – and who among us would turn down a free Casino or two? This entry was posted in Music and tagged 100% Fun, 1990s, Aimee Mann, alternative rock, ambience, Audio Engineer, audio engineering, Brendan O'Brien, Epiphone semi-acoustic, Girlfriend, grunge, Matthew Sweet, mixing, Nick DiDia, power-pop, recording drums, Richard Hell, Richard Lloyd, Robert Quine, Sick of Myself, sound recording, Sound recording and reproduction, Television, The Posies, The Voidoids, underrated drum tracks, underrated drummers on October 30, 2015 by rossjpalmer. The first for-real band I ever saw play a for-real gig on a for-real stage with a for-real PA in a for-real venue was Redd Kross in 1997 at the Astoria in London, supporting the Foo Fighters. They sounded fantastic. I’d never (literally) heard anything like it. I was 15 and I’d played a gig or two with the terrible high-school grunge band I played bass in, but that hadn’t prepared me for what a focused, tight and loud rock band on stage would sound like. They had loud guitars, bashing drums and glorious harmonies. Nostalgia may be playing a part in this assessment – and granted, 15-year-old me had nothing to compare it to – but still, their set remains one of the best I’ve seen by a support act. That and a recommendation in (I think) the Melody Maker prompted me to go out and get their then single, My Secret Life. Redd Kross was founded by brothers Jeff and Steve McDonald in 1982, and its first gig was supporting Black Flag. Probably because of their love of everything kitsch about the 1960s and ’70s, Redd Kross are sometimes left out or downplayed when the history of American punk is retold, but they were there and part of it almost from the start. On guitar in the band’s early days was Greg Hetson, later of the Circle Jerks and Bad Religion, and a virtual who’s who of LA punk would go on to pass through its ranks: Dez Cadena and Ron Reyes (both Black Flag), Vicki Peterson (the Bangles), Robert Hecker (It’s OK) and Jack Irons (Pearl Jam, Red Hot Chili Peppers), to name a few. My Secret Life was pretty far removed from the band’s on-stage sound, which mixed sugary harmonies with some seriously loud distorted guitars. My Secret Life is a big – huge – melodramatic ballad, with piano, acoustic guitar, tympani, Mellotron strings and the band’s trademark 3-part harmonies, a sort of updated Spector. Surprisingly grand for a band that spent most of its career celebrating everything low-brow and trashy about Californian teen culture. It’s customary for a certain type of critic to point at a cult guitar band (those artists that take Big Star and Raspberries as the starting point for their sound) and say that they made “perfect pop music”. This sort of boosterism is usually misplaced. There’s always something that stopped those bands being as big as the Beatles were (or even as big as the Raspberries or Cheap Trick). Marshall Crenshaw was too gawky. The Posies started off too fey, then got too muscular. Jellyfish lacked a really great lead singer. Teenage Fanclub didn’t quite have the choruses. But any band can produce a perfect moment. That’s what’s so great about pop music. And when Redd Kross crash into that final chorus of My Secret Life – this time complete with tympani – and harmonise the word “life” over an unexpected F minor, it pretty much is a moment of pop perfection. This entry was posted in Music and tagged Bad Religion, Black Flag, Brian Reitzell, California, Charlotte Caffey, Cheap Trick, Circle Jerks, Dez Cadena, Eddie Kurdzeil, Foo Fighters, Greg Hetson, harmonies, harmony singing, harmony vocals, It's OK, Jack Irons, Jeff McDonald, Jellyfish, kitsch, London Astoria, Marshall Crenshaw, McDonald, mellotron, Melody Maker, My Secret Life, Pearl Jam, power-pop, punk in LA, Red Hot Chili Peppers, Redd Kross, Robert Hecker, Ron Reyes, Secret Life, Show World, Steve, support acts, support bands, teen culture, Teenage Fanclub, The Bangles, The Go-Gos, The Posies, The Raspberries, tympani, Vicki Peterson on December 27, 2014 by rossjpalmer.